Heavenly blog! : No. 927: Jan Hanvold on Radio 107.7 in Oslo several times: "To hell with anyone who does not agree that I am re-married!" No. 927: Jan Hanvold on Radio 107.7 in Oslo several times: "To hell with anyone who does not agree that I am re-married!" Hanvold is so vulgar and nasty. Here on the radio in Oslo he cries out that he is guilty of two adultery. But to hell with all those who do not accept that I am remarried he cries out. How spiritually blind must be to see that he is a false prophet as Jesus said many would come in the end times? Matt. 24. 11 and many false prophets will arise and deceive many. Synod in 2016 to take a position on gays and lesbians priests and marriage! Anyway, it's only a matter of time before this is allowed! But where "started" it all? What word of God says about sin? Can we shift the Valter with which sins should be accepted and which should not it? The laws and God's word, it is also the same? No, we as Christians should follow the word of God even at the points where the laws accept sin. Eg. Bible says that pedophilia is a sin, but it also says the laws and the Bible the same. But what when it comes to marriage? Der said Norway Law, skill and poison you as much as you like and want. What scripture says? Marry only once, that marriage lasts until one dies, period! Where started this backsliding we see today? As I see it, it was the day it was accepted and widely accepted that ministers and other confidence- people were allowed to remarry. It was like putting dynamite in the dam, cracks were set. It is only a matter of time before the whole dam goes! Soon all sins accepted in the world, when it becomes the same in God's church? The complaints 1. 10 enemy laid hands on all her precious things; for she saw the heathen entered into her sanctuary, whom thou didst command they should not enter into thy congregation. This is now about to happen, the same standard that is among darkness children are among those who will be the children of light. How dark is it not been that Jesus spoke about ?! Joh. e. 9. 4 I must work the works of him that sent me, while it is day; night comes when no man can work. It is now becoming so dark, even in the church of God that it is impossible to do the deed, and service God has set another? It almost looks like ?! The believers have fail the Lord, but are not aware of it and do not see it as Samson was and the church in Laodicea! Matt. 24: 10 And then shall many be offended, and shall betray one another and hate one another; 11 and many false prophets will arise and deceive many. 12 And because iniquity shall abound, the love wax cold most. 13 But he who endures to the end shall be saved. 3. 19 All that I have loved, them I rebuke and chasten. Let there be serious and turn! Is this done in love? How is the love we read about in 1 Corinthians. 13? v. 6 The not rejoice in wrongdoing, but rejoices in the truth. It had to be serious and need to take it to heart that the message concerned them. 20 Behold, I stand at the door and knock. If anyone hears my voice and opens the door, I will come in to him and eat with him, and he with me. The whole congregation was very difficult to accept the message because they wanted it that scratched them in your ear. But it was, if possible individual understand the church that would take it to heart? They would experience the close fellowship and communion with Jesus again. 21 He who overcomes, to him I will sit with me in my throne, even as I also overcame and sat down with my Father on his throne. Again caters Lord appeared to the victorious and who want to follow him. Once saved, always saved is one of Satan's lies. Salvation is something one should also grow in and take care of. For he who overcomes one should get the same position and position himself. We will sit with Christ in the heavenly. Efes. 2. 6 In Christ Jesus he raised us up from death with him and seated us in heaven with him. (End of quote). 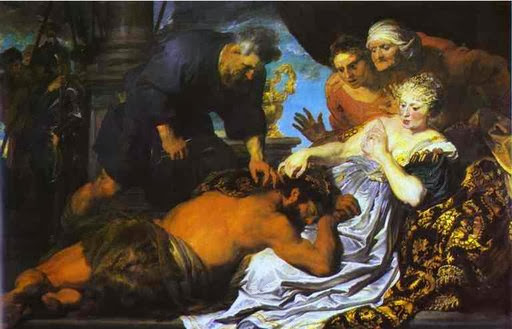 Picture of Samson and Delilah, painting by Anthony van Dyck, before 1620. Both Samson and the church in Laodicea thought that it was far better off with them than it was in reality. They lived in a powerful spiritual delusion where one was not aware that a set of spiritual bankruptcy. Tragic that so also grips with the Norwegian Christianity in a very large extent. Samson failed in the moral and the church in Laodicea was introspective and democracy Council and the word of God was set aside for that most opinions meant more than what God said in their own words! 2 Pet. 1. 3 As his divine power has granted to us everything pertaining to life and godliness, through the knowledge of him who called us by his own glory and virtue 4 Whereby are given unto us exceeding great and precious promises: that by these ye might be partakers the divine nature, having escaped the corruption that is in the world through lust, 5 For this very reason, make every effort to supplement your faith with virtue, and virtue knowledge, 6 and in knowledge temperance, and temperance patience; and to patience godliness, 7 and godliness with brotherly affection, and brotherly affection with love. 8 For if these things are yours and abound, they make you to be not idle nor unfruitful in the knowledge of our Lord Jesus Christ; 9 for he who has not these things is blind, shortsighted, having forgotten that he was purged from his old sins. The apostle Peter mentions: "for those who do not have these things, he is blind, myopic." 1.) There is no climate or opportunity in the church to debate and discuss things. We read among the early Christians that they debated, examined and empty spoke to each other right. It was a healthy and ward environment to exchange views and opinions, when revival burned like hottest. Event we can not communicate and discuss among ourselves then falls quickly the spiritual temperature. 2.) Than looking through fingers with heresy. We can not take lightly anything, least when things break God's word. I have no trouble accepting that others think and believe differently than myself. But to accept baptism, gjengiftede among Christians, female Pastors and elders etc. Then have a well too far in accepting faiths. I have written against remarriage among Christians and has also mentioned preachers whose names Jan Hanvold. And've really got to hear it. He does so much good is said and much else. It helps null and void if one accepts the sin in their own lives scripture says many, many places. See here: 1 Cor. 13. 3 And if I give away to feed all that I own, and though I give my body to be burned, but have not love, it profits me nothing. 4.) Grace gifts are inoperative. This with the charisms works is of utmost importance in God's church. It is by revelation we are led, without it we end in delusion or stagnation. "The Lord went before them by day in a pillar of cloud that showed them the way, and by night in a pillar of fire that shone for them. "(2 Mos.13,21-22). So shall also the gifts make a difference, where we are admonished, comforted and encouraged. And by that gifts are in function is sin and the sinner revealed stripped and the way he / she can find salvation in Christ Jesus. 1 Cor. 14. 3 the other hand who prophesies speaks to men for edification, and exhortation, and comfort. 24 But if all prophesy, and there come in, an unbeliever or unlearned, he is convinced he by all and judged by all 25 of his heart hidden thoughts revealed, and so he will fall on his face and worship God, declaring that God is really among you. 5.) The ability to judge is not emphasized. It is clear as it has been in many parishes and churches is a not critical and healthy try everything on God's word and Spirit sanction, then everything is permitted and equally good. It is not, it is something that is right and which is wrong, etc. 1 Cor. 14. 29 prophets speak two or three, and let the others! 30 and get another revelation while sitting there, let the first be silent. It is clear that we should not despise or call heed prophetic speech, but what are the others doing? "The others try it!". The secret that things will develop negatively, that is a trying and constantly checks. I have built several houses and an apartment. What did we do? We did some work, so we controlled and leveled etc. Constantly. What does one do in God's church, not least today? Have ne person trust you can almost say competent, flows and preach the most part. And prophesying the "big" man of God, then it must be from God. It is enough to mention some that are downright false and as well not come with a straight prophecy that the late Aril Edvardsen and Emanuel Minos, they are through corrupt yet believe the vast majority of the Norwegian Christianity of such false prophets! 6.) Than do not respect God's word, eg may allow one female Pastors and elders. This women who will take over the man's area is also an eschatological sign. God's word says clearly throughout the scriptures in both Old and New Testament that there are some areas that are reserved for the man. As example. to be a teacher and shepherd of a church: The Bible tells us that a pastor is an elder (1 Tim 5:17), and that elders should be "husband of one wife" (Titus 1: 5-7). The Greek Bible says: "man to one woman." Furthermore, Paul says in 1 Timothy 2: 12-13: "I do not permit a woman to teach, nor to have authority over men; she must be silent. 13 For Adam was formed first, then Eve. "Since Paul joined this with the order man was created, one can not say that it has something to culture. There are some freak masses about that word that the woman should not speak in the church collection, but it comes to her skvaldring and cackling, not if she prophesy, pray or witnesses of God's grace. Here we must distinguish mustache from snowing! 7.) A fixed overnight gjengiftede preachers and those who live directly in striven with God's word, just "for" they do so much "good"! Sin is sin, whether it is homosexual, lesbians, remarriage or marry a divorced. It is not large and small sins before God. To steal is proven sin that a big bank robbery. We must remember that all bank robbers began as petty thief, therefore we can never qualify and measure sin. All sin is dangerous and separates us from God, we must not compromise and overlook anything. 8.) Love has been tepid and cold, it looks one at that one seeks out the falls without past. It amazes me that Christians do not care about the one, when it needs help. A leaves another as fast to "Satan". It is not good, we have a responsibility to take care of each other, they also troublesome and falls without passing A4 pattern. 9.) The inner cohesion and respect is no longer intact. A new commandment I give unto you, That ye love one another! As I have loved you, you also should love one another. By this shall all men know that ye are my disciples, if ye have love one to another. (Jn. 13 v34-35). This is easy ... .not true? If we Christians, the church is filled with love for each other, we will show the world what Jesus has said and with that show light to a lost world. When we walk with Jesus, that you love Jesus and have a heart relationship with Jesus who is so strong that you hate sin, in such a way that sin pain when falls into sin (because it makes you). But when the heart relationship with Jesus is so strong, it will rub off on others around you, because love is care and compassion. We have love in Jesus, because we are plugged into vine that is Jesus. We have part in him. See John 15 v1-17. Thus, - the love we have from Jesus is caring and compassion for all people, but especially to the faith own people (Gal 6 v10). Thus, from what we read in John. 13 v34-35 shall all men know that ye are my disciples, Jesus said. It will not say that all are saved, but all are confronted and demonstrated with what Jesus said. And Jesus said: How shall all men know who you are when you have love for one another. How will the world see that Jesus is real. So easy is it now to get people to understand that Jesus is alive. The answer is simple on how people should understand that Jesus is alive. The answer is so simple that we've overlooked it! The Bible is easy to understand, we have indeed the author of Scripture in us by Holy Spirit (John 14 v16-17 + v26). We do not need long Bible studies or complicated theology that people will see Jesus. No, the Bible is simple, earthy and practical. I can not understand those who believe the Bible is difficult to understand. The problem is perhaps that they never open it and read it. Well, Jesus said: If ye have love one to another, shall all understand. We have an obligation, by confronting the world with the gospel. Jesus said: Go into all the world and preach the gospel (Mark 16 v15). There is also another thing I want to show you. It is that love for each other is not a choice, it is a commandment! A new commandment I give unto you, ye love one another (Jn. 13 v34). Yes, the way Jesus loves us, that unselfishly where the others best in focus. Jesus says that we are able to love like that, the whole world will see it! Because such does not exist in the world.The world will have the selfish, self-righteous and having mentality. By that we love each other will thus this situation that society is stale, get turned upside down. The world will soon see that the Christians, yes they love - and that this is totally abnormal world. The unsaved, the early days of Christianity time, said of the first Christians: "See how they love one another!" Thus, the grip people most was thus the mutual love they demonstrated in the Christian community. Some of those who work with the oldest church history, argues that one of the key factors in the rapid growth in the early days of Christianity time just was the community, which was characterized by love. Whether we like Jesus sitters do not go against the world by showing love, what are we then? What are we as Christians - without love? Well, nothing, worthless. See Matt 5 v13. We are plugged into the vine who is Jesus and receive love from there, but we must choose whether we will disclose this love .... Jesus says that this is a commandment. So what are we when we are not using love for each other? Jo we are disobedient! We disobey the commandment Jesus gave us, that you love one another! (Jn .13 v34) Well, we have two choices. 1. Love one another as Jesus loved us - then we are obedient. 2. Do not love one another - then we are disobedient. I would like to "shove to you" and get you to stop and think about this you just read! I think we as a church in Norway is moving towards a new era, if we choose it! People around us looking for something meaningful they can fill your life with. Humans can not find peace until they find Jesus. As Jesus sitters we must act as good role models, we have plenty of love in us from Jesus to love each other and our neighbor, but we must therefore choose to take this into use. 10.) There is no alternative to the apostate and lukewarm Christianity is today. God raise up preachers and churches throughout Norway and worldwide who stand before God, his word and he delights in and over! Joh. Revelations. 3. 18b: salve to put on your eyes, so you can see. What is eye ointment? It can stand for several things, but anoint Bible has that God is doing something. That God Ointments us with his Spirit. And how come eye diseases? There are several things that come into play, but eye disease may also be symptoms of other diseases in the body. Therefore, it is also like indication that you have problems with the eyes of another and bigger problem. For a Christian is sin in all its forms and shapes always the biggest problem when it is our sin that creates distance and separation between us and God! Isaiah 59. 2 But your iniquities have made divorce between you and your God, and your sins have hidden his face from you, so he did not hear. God's church stands today at a watershed when so much of the world and its essence has become a congregation. The complaints 1. 9 Her filthiness is in her skirts; she was not thinking about what their end would bring her; she cometh down wonderfully, no comforter. Lord, see my misery! The enemy has triumphed. 10 The enemy laid hands on all her precious things; for she saw the heathen entered into her sanctuary, whom thou didst command they should not enter into thy congregation. Her impurity hanging by her today also by all those divorced, gjengiftede, divorced and other sins that are becoming more and more accepted and accepted. There is so much that soon it is abnormal, normal. Sin and the verse is replaced with true fear of God and respect for God's word. Where will it end? There we determine at our option, either bad or good!